What do your hay bales weigh? Knowing exact bale weights is advantageous when buying or selling hay and also when determining on-farm inventories. How many round bales of hay will your cows consume in a week? The answer will vary depending on the size and stage of production of your cows, the quality of the hay, and, most importantly, the weight of the bales. It is better to think in terms of how many pounds of hay the cows will consume instead of how many bales they will consume. Bale weight can vary tremendously. Bale weight affects not only the number of bales that should be fed but also the cost of feeding and transporting them. 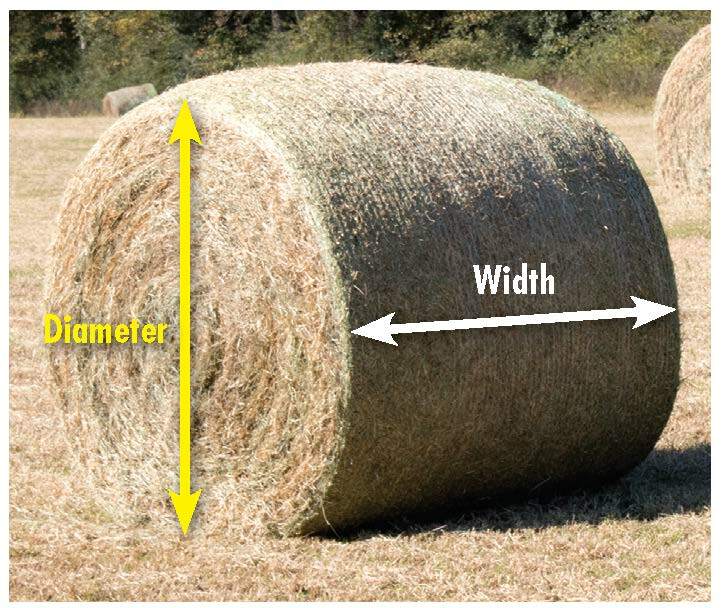 Round bales are described as bale width by bale diameter, or bale height. For example, a 5 x 6 bale would be 5 feet wide and 6 feet in diameter, and a 4 x 5 bale would be 4 feet wide and 5 feet in diameter. The table shows the effect that bale size has on weight by using a 5 × 5 bale that weighs 1,100 pounds for comparison. If all bales had the same density, those of varying sizes would range in weight from 563 to 1,584 pounds. In addition to size, bale density also has a major impact on bale weight. Density, as influenced by tightness of wrap or bale compression, can vary considerably depending on operator preference and the equipment being used. Most balers have a range of settings that allow the operator to increase or reduce wrap tightness and bale compression. Also, some balers can compress more tightly than can standard equipment; these types of balers are generally used for baling low-density forages like wheat straw. Whenever possible, hay should be bought and sold by the ton instead of the bale. The importance of pricing hay by the ton is illustrated in the table. The fifth column shows what the price per ton would be, if all bales — regardless of weight — were priced at $45 each. The 1,100-pound bales would cost $81.82 per ton ($45 divided by 1,100 pounds equals $0.04091 per pound; 2,000 pounds multiplied by $0.04091 per pound equals $81.82 per ton). In comparison, the 880-pound bales would cost $102.27 per ton. In addition to cost per ton, also calculate the cost per pound of energy (for example, total digestible nutrients [TDN]) and protein. To determine nutrient content, sample each load or cutting of hay and send it to a reputable lab for testing. The most appropriate analysis will depend on forage species, intended use, and laboratory experience, so consult with a nutritionist for specific testing recommendations. These equations can be used to calculate the cost per unit of TDN, protein, or any nutrients found in hay as well as other feedstuffs and supplements. Bale weight also affects how long it takes to feed and how frequently hay is put out. For example, a 1,300-pound cow eating 2.5 percent of its body weight would consume 32.5 pounds of hay per day. The last column in the table illustrates how many bales would be consumed by 30 cows per week. Would you rather feed 5.0 or 9.1 bales per week? Unfortunately, many areas of the U.S. are currently abnormally dry or in a drought, and long-term forecasts are predicting below average rainfall for the next three to six months. Now is a good time to evaluate hay reserves and make plans if additional hay is needed. This article appeared in the January 2018 issue of Hay & Forage Grower on page 22.